Like real pet, like animated pet. [Bubbles] was a mongrel, but a really nice dog, and she had fitted so well into our lives. So I brought her into Xanth, where she can live the life she could not continue with us. Most people love animals, especially their pets. Some authors may even put some sort of reference to a real-life animal in their work. Most often, it will be their own pet, either as a memorial or just because they love him that much. It may be just the animal's name, similar to the human equivalent, Tuckerization. This is justified in a film if the pet themselves is playing the pet named after them; after all, it's much easier to get an animal to respond to its own name. The whole animal, not just the name, may be put into the work as well. Or, perhaps, they based an animal character off a real-life one, such as its appearance or mannerisms, even if they didn't use the name. The DC Comics miniseries Superman for All Seasons, by Jeph Loeb and Tim Sale, gave teenaged Clark Kent a dog named Shelby, after Sale's own dog. It was a two panel gag, but Shelby later became more notable as the golden retriever in Smallville. Charles Schulz based Snoopy on his childhood dog, Spike. Later, we meet Snoopy's brother, who is named Spike, as well as another brother Andy, based on a dog Schulz owned later in life. The cat, Horse, in Footrot Flats was based on a real cat who hung around the author's farm. Hobbes was very much inspired by one of our cats, a gray tabby named Sprite. Sprite not only provided the long body and facial characteristics for Hobbes, she was also the model for his personality. She was good-natured, intelligent, friendly, and enthusiastic in a sneaking-up-and-pouncing sort of way. In My Little Pony Micro Series, Luna's pet possum Tiberius is apparently based on Price's real pet possum . In Groo the Wanderer, Groo's loyal canine companion, Rufferto, was based on Sergio Aragonés' own dog, also named Rufferto. Whenever Aragonés makes cartoons about himself and his friends, Rufferto will always look like Groo's Rufferto. The Original Character Sadie in Angel Of The Bat and its sequel is named after the writer's beagle, who passed away at the same time as the character's introduction. The story contains some nods to this, most prevelant being that the character wears a dog tag necklace. The character Indiana Jones is named after creator George Lucas's dog Indiana, who was also the inspiration for Chewbacca. There is also an in-universe example that reflects the Real Life situation: in Indiana Jones and the Last Crusade, it is shown that the character chose the nickname "Indiana" after his family's dog. This was taken even further in Indiana Jones and the Temple of Doom: Willie was the name of Steven Spielberg's dog, and Short Round the one of the co-writers. In Disney's Dumbo, it is implied that Dumbo's father is Jumbo, a famous elephant that appeared first at the London Zoo then at the Barnum and Bailey Circus. Dumbo was supposed to be named Jumbo Junior, but ended up being known by a mocking nickname instead. Of the justified due to the animal playing the character variety, the dog Jed played the eponymous creature in The Thing (1982). He's also been in a couple other films. Interestingly, the dog is never named onscreen (only in the credits), but fans of the movie have taken to referring to the dog with this name. While Piers Anthony was writing his Xanth novel Demons Don't Dream, his dog Bubbles died, so he decided to put her into the book at that point. Part of his explanation can be seen in the page quote. Mare Imbri is also based on Blue, a horse he owned at the time. Blue died right before he started writing the same book, so, as he pointed out in the author's note, it seemed right that Mare Imbri would lead Bubbles into Xanth. There was a contest for the Joe Grey mysteries for fans to send in descriptions of their pet cats. Three were randomly selected as occasionally-recurring characters. In the Warrior Cats series, Brambleclaw and Sorreltail are named after author Cherith Baldry's cats, Bramble and Sorrel. Sol's appearance is based on a cat named Aslan, and Millie's appearance is based on the pet of one of Vicky Holmes' coworkers (her name comes not from his cat, but from the fact that he is a fan of the Millwall soccer team). 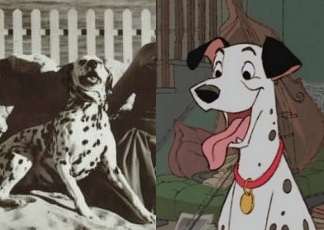 Dodie Smith's inspiration for The Hundred and One Dalmatians was her dalmatian Pongo; naturally, she put him into the book as the main character. Lady Jane, the evil-tempered gyrfalcon who is constantly attacking Hodgesaargh is named after a real falcon, just as Hodgesaaargh is named after a real falconer. Apparently, Greebo, Nanny Ogg's gigantic ill-tempered cat, has some qualities of a Russian Blue cat Terry Pratchett once owned. However, Greebo is significantly more cunning and badass, because the actual cat, according to Pratchett, has the sense of an elastic band, if that wasn't insulting to stationery. Jean Craighead George has based many animals in her books on pets she's had in the past. One notable example is that the behavior of the owl in There's an Owl in the Shower is based on a pet owl, Yammer, that she used to have. She tells stories about her wild pets in ''The Tarantula in My Purse". In Sideways Stories From Wayside School, there is an in-universe example: a boy named Nancy, who dislikes his name, trades names with a girl named Mac, who disliked hers because she had been named after a dog. In The Wolf Chronicles, TaLi is actually named after a husky puppy named Talisman who was helpful to the author's research. Arthur Conan Doyle once owned a dog that was half spaniel, half lurcher. In-universe, his name is Toby and Sherlock Holmes considers him more useful than all the police detectives in London. Mog, in Mog the Forgetful Cat and sequels, was based on Judith Kerr's own cat Mog. Tailchaser's Song is partially In Memoriam to an orange tom Tad Williams' had named Fever. Tailchaser, the protagonist of the book, is also an orange tomcat. Ubu Productions is named after producer Gary David Goldberg's dog Ubu Roi, a black labrador retriever. The Vanity Plate for Ubu's productions is a photograph of Ubu Roi with a flying disc in his mouth. Along with the picture is Goldberg's voice saying "Sit, Ubu, sit! ...Good dog! ", followed by the sound of a bark. This can be seen here . A beagle is seen in several episodes of Good Eats. That beagle actually is Alton Brown's Real Life pet dog. J Michael Straczynski wrote an episode of Crusade in which Max's ex-wife's cat was kidnapped by enemies, causing Max to demonstrate how tough he could be. The ep was dedicated to JMS's own recently deceased cat. Not to mention Jonathan Coulton's soul-crushing "Space Doggity". The composer of the song "Hampster Dance" actually got the song name from her dead hamster. Guess where she got the lyrics from! "Jenny," from Chicago's sixth album, is about guitarist Terry Kath's Saint Bernard. Paul Simon's "Mother and Child Reunion" was inspired by the death of his dog. Not that you'd guess from the lyrics. The Beatles' "Martha My Dear" is about Paul McCartney's dog. Frank Zappa did this literally, featuring a poodle named Fido in many of his song lyrics, especially on Over-Nite Sensation, Apostrophe (') and Roxy & Elsewhere. He too owned a dog named Frunobulax, which became the Giant Poodle Monster Frunobulax in the song Cheepnis in Roxy & Elsewhere. The Misfits' guitarist Doyle allegedly borrowed his stage name from the family dog. A Silver Mt. Zion, sister project to Godspeed You! Black Emperor, named the closing track of their debut album "For Wanda", after guitarist Efrim Menuck's dog, who passed away while the album was being recorded. Aesop Rock has the song "Kirby", which is a loving tribute to his cat. The police dog in the first Ace Attorney game is named after the creator's Pomeranian, Missile. He doesn't do anything useful in that game, but he does eat all of Larry's hot dogs. Though Missile's taste for those hot dogs actually makes him useful for finding an important clue in the last case of Ace Attorney Investigations. A dog named Missile returns (though it's not the same Missile) in Ghost Trick as a full-on main character, this time with additional Pomeranianness. Naughty Dog originally had a company mascot in the form of Morgan, the dog of one of the team's developers, before Crash Bandicoot would replace him. When Morgan passed away, he got a tribute in Jak II: Renegade as an Easter Egg. The company has since credited the company dogs in every game as "mascots, morale-boosters and food patrol", sometimes with photos. In Fallout, a dog named Sasha appears at the Cathedral. Sasha is named after Interplay Entertainment producer, Vince Denardo's dog. Most games produced by Skip Limited—including Chibi-Robo!, Gift Pia, and Captain Rainbow—include a black-and-white dog named Tao, who frequently has a lazy and hungry personality. Tao was a real dog belonging to one of their head game designers. Even though he passed away in 2009, Skip still features a few hidden references to him in their games. Guppy the cat from The Binding of Isaac, whose body parts and related items (a head, a tail, a paw, a hairball and even his whole corpse) can be collected by Isaac, was based on a real cat owned by Edmund McMillen, the game's creator. When Guppy died during the development stage of Rebirth, a memento item - his pink collar - was added to the game, granting the owner a chance to resurrect upon dying. In Minecraft, a special skin rabbits get when named Toast was implemented as a memorial for a missing rabbit of certain player's girlfriend. For the 2013 Killer Instinct, the devs made an alternate costume for Sabrewulf based off of Benny, Maximilian Dood's Pomeranian; while Max worked on the game's trailers and cutscenes, it was also a "thank you" for his efforts to promote the game. Kirby, Cole's basset hound in PvP, is named after (and modeled on) Scott Kurtz's own basset hound Kirby. Guineas, one of Grace's siblings in El Goonish Shive, is based on a friend's guinea pig, due to a lack of ideas. Both of the cats in Two Lumps are based on the author's (now deceased) pets. In Shortpacked!, Maggie Willis's hamsters Snkrs and Anakin appear as Galasso's minions, and then, when the drawbacks to hamster minions become apparent, as Amber's pets. On Honorable Hogwarts, the character of Lucy Frost is named after her creator's cat. As in, the cat's full name... the guy behind the character is actually named Frost in Real Life, so Frost is also the cat's surname. The creators/animators of the parody web series How It Should Have Ended do this a lot, hiding a drawing of a dog and at one point the dog's name backwards in their videos, in tribute to lead animator Daniel Baxter's dog Kiddo. In the Furry Basketball Association, Ryan Rottshep is based on one of the contributer's dogs. Lion from Steven Universe, a magical pink lion, is named after a cat that lived around a cabin Rebecca Sugar and Ian Jones-Quartey stayed in during the series early planning stages. In Young Justice: Invasion, Wally and Artemis have adopted a sleepy white pit bull. According to the producers and Stephanie Lemelin, Artemis' voice actor, he's explicitly modeled after her own sleepy white pit bull, Brucely. When asked what the dog's name was, Greg Weisman answered "I want to say Brucely." The word "jumbo" as a synonym for "really big" is a reference to the elephant Jumbo that was mentioned above. John Wayne's nickname "Duke" comes from a dog he used to own, even back before he became famous. Bindy Sue Irwin, daughter of the late Steve Irwin, is named after a crocodile he worked with frequently and his favorite dog.